Entropion is the medical term used to describe a condition where the lower eyelid and eyelashes turn or roll inward towards the eye. This causes the eyelid and its lashes to constantly rub against the cornea (the front part of the eye) and conjunctiva (the mucous membrane that protects the eye). Entropion is usually caused by relaxing eyelid tissues as a result of aging. This condition is more often seen in elderly people whose supporting eyelid structures have stretched. As a result, the eyelid turns inward. Entropion may also be caused by inflammation or scarring on the inner surface. Sometimes, Entropion is present at birth (congenital) if the eyelids are not formed normally. Chronic Irritation Entropion can cause chronic irritation to the eyelid and the eye. This can result in excessive tearing, crusting on the eyelid and mucus discharge, a feeling that something is in your eye, irritation of the cornea, and impaired vision. 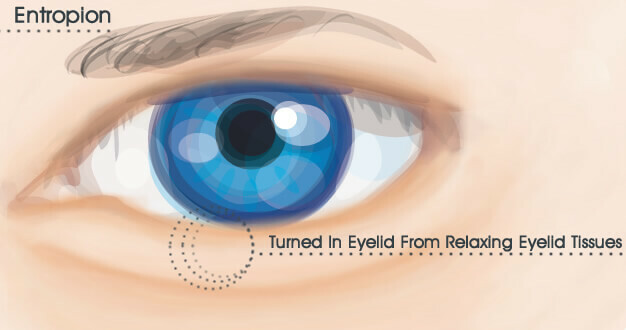 Chronically Turned In Eyelid Damage to the cornea (the clear part of the eye), including infection and scarring, may develop due to the chronically turned in eyelid. These symptoms could potentially cause permanent damage to the eyes. How can Entropion be treated? The usual management for Entropion is surgery. Surgical treatment will tighten the eyelid to restore some of its elasticity. Surgery will also reposition the eyelid so it lies normally against the eye instead of turning inward. A variety of surgical techniques can successfully manage Entropion. Dr. Selem can speak to you about the best technique to treat your individual condition. If a patient is not able to undergo surgery, tape or sutures can be used to temporarily reposition the eyelid and to protect the eye. Lubricating drops and ointments for the eye are also helpful on a temporary basis. In infants Entropion usually resolves spontaneously within a few months, but the condition will occasionally need to be treated. When other factors contribute to the presence of an Entropion, they may require special treatment. Medications are frequently used to control inflammation or infection of the eyelid and to treat scars. Scar excision and tissue grafts may also occasionally be necessary. Is Entropion Repair right for me? At Miami Eye Center, Dr. Joseph Selem will meet with you during your private consultation to assess your individual situation. Dr. Selem can help you decide if Entropion Repair in Miami is right for you. See the beauty in yourself and the world around you in crisp, clear detail today! Request an appointment online or call Dr. Joseph Selem and the staff at Miami Eye Center at 305-444-0221 to schedule your private consultation.